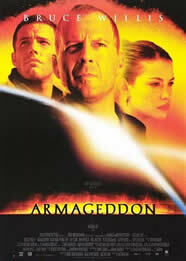 Armageddon Research Papers discuss a movie written by Robert Roy Pool about a possible obliteration of the world by a giant meteor. The movie Armageddon, written by Robert Roy Pool and Jonathan Hensleigh and produced by Jerry Bruckheimer, is a sensationalized drama of the possible obliteration of the world by a giant meteor. While steeped in many scientific theories, the movie of course relies on the dramatic risks associated with such an event rather than the rationality that would most likely take place under real circumstances. Of course that would not sell movies. Nonetheless, Armageddon relies on correct scientific data to base this conceivable premise on. Beginning with the opening narrative that explains the creation of geographical diversity of the Earth’s surface, the movie makes one really think about the plausibility of a giant meteor and its effects on the planet Earth. Often speculated, the chance of a collision with a giant meteor is not out of the realm of relativity. Whether or not, NASA would choose a path such as the movie proposes to eliminate such an event is rather speculative. Some of the more intriguing scientific perspectives used in the movie begins with a scene right in the beginning of the movie that has a team in space that blows up from a meteor shower that hits them. Suddenly NASA is scrambling to figure out what happened. It is a call from a personal stargazer that alerts NASA to a giant meteor moving towards the Earth. This is somewhat hard to fathom. First that NASA would not be aware of anything with a space mission in progress. Perhaps too much credit is given to NASA, but they surely have the technology and manpower that is constantly surveying space as to any foreign objects. Secondly, their equipment is far more technologically advanced than a little old man’s observation tower. Some details that are quite plausible though are NASA’s ability to predict the actual hour that the meteor will break the Earth’s atmosphere. Technology certainly can permit such calculations. The methods that NASA devises for landing the specialist teams on the meteor are also plausible. NASA has the technology to work around the zero gravity of space to maneuver the necessary equipment to where it needs to go. Relying on an oil drilling team with absolutely no scientific knowledge of space and astronautics is a highly unlikely scenario. Pursuit of Happiness - Pursuit of Happiness Research Papers look at a sample of an order placed on an assignment based on a movie. Literary Elements - Paper Masters provides the various Literary Elements required in college level research papers. Astronomy - Paper Masters is here to help on any topic with our awesome repository of astronomy research paper ideas. The Universe - The Universe research papers on the scientific view of the universe using astronomy and physics. Paper Masters writes custom research papers on Armageddon and discuss a movie written by Robert Roy Pool about a possible obliteration of the world by a giant meteor.